Travel Channel announces the first of a new 13-episode batch of its Mysteries at the Museum TV show will premiere Friday, July 1, 2016 at 9:00pm ET/PT. From the wording of the announcement, it seems these episodes are a continuation of the 10th season, but no season number is specified. In April, Travel Channel renewed Mysteries at the Museum for an 11th season, so color us a wee bit mystified. Get the details from this Travel Channel press release. 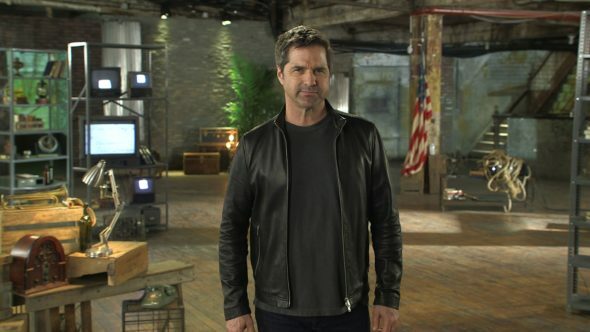 NEW YORK (June 8, 2016) – Travel Channel’s “Mysteries at the Museum,” hosted by history explorer Don Wildman, will premiere 13 new one-hour episodes beginning Friday, July 1, at 9:00 p.m. ET/PT. The popular series has attracted more than 8.8 million total viewers this season. In each episode, Wildman investigates extraordinary stories and the artifacts that inspired momentous events. Through compelling interviews, rarely seen archival footage and captivating recreations, Wildman reveals incredible treasures. He inspects a key from the 1890s that unlocks the story of William Waldorf Astor and his family’s revolution of luxury in New York City; explores a 15-foot long aircraft that recalls an ambitious dream that almost changed America forever, but never took off; and examines a compass belonging to famed explorer Percy Fawcett, who is believed to have inspired the beloved fictional character Indiana Jones. For virtual and active travelers who want to go on a thrilling quest; taste other cultures; enjoy the mystery of the unexplored; get a dose of epic adventure or a splash of wacky fun; there is no better daily escape than Travel Channel. Reaching more than 89 million U.S. cable homes, Travel Channel is the world’s leading travel media brand. Fans also can visit Travel Channel for more information or interact with other fans through Facebook, Twitter, Pinterest and Instagram. Headquartered in Knoxville, Tenn., Travel Channel is owned by Scripps Networks Interactive, Inc., which also owns and operates HGTV, DIY Network, Food Network, Cooking Channel and Great American Country. What do you think? Are you a fan of the Mysteries at the Museum TV series? Do you plan to watch the July premiere? More about: Mysteries at the Museum, Mysteries at the Museum: canceled or renewed?, Travel Channel TV shows: canceled or renewed?